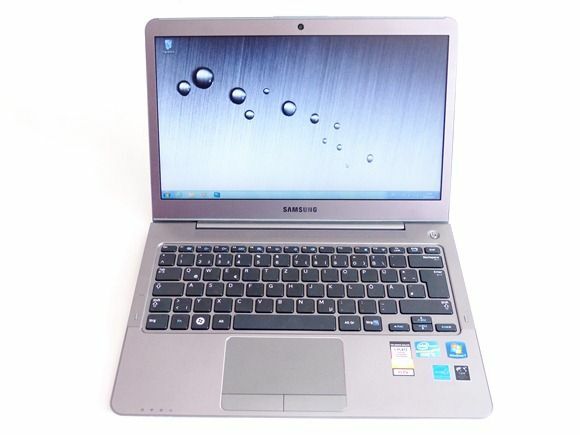 When the Ultrabook launched in June 2011, Samsung were ahead of the curve because the Series 9 had already launched into the thin and light space. It was expensive but brought the best of Samsung’s engineering to the table in exactly the way the Ultrabook was to do just months later. Over time the price has come down so it was difficult to imagine how Samsung might fit a product into the Ultrabook market but at CES the strategy was revealed as the Series 9 received a complete refresh to remain as the premium thin and light product. The price was obviously pushed back up which left space for what is effectively a tier-2 thin-and-light in the Series 5 Ultrabook. There are two models in the range and the pricing is competitive; especially in Europe where the 13” Series 5 is offering a great package for a price that is currently only beaten by the Acer S3. The 14” Series 5 offers a DVD writer and a good set of specs but it’s the base model Series 5 13” were testing here. Bought (for a family member, not sent by a PR company) in Germany, this is an extended review of the NP530U3B. The initial unboxing and overview video is here. We’re talking about a fairly basic package with no surprises in or around the box. The Series 5 looks good, clean and classy but it doesn’t shout ‘design’ like some other Ultrabooks do. There’s no tapered front to make it look ultra-thin and on picking it up it feels just as you expect. 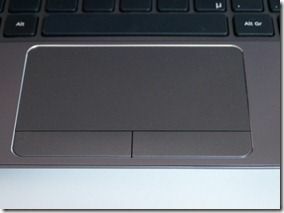 Most people are going to be impressed at the size and weight though; this reviewer has been a little spoilt by handling Ultrabooks that are thinner and lighter. Opening the Series 5 up to check out the keyboard reveals nice feedback and a nice feel to the touchpad and buttons and looking around the ports isn’t going to result in a ‘how to I transfer my pictures’ shock. 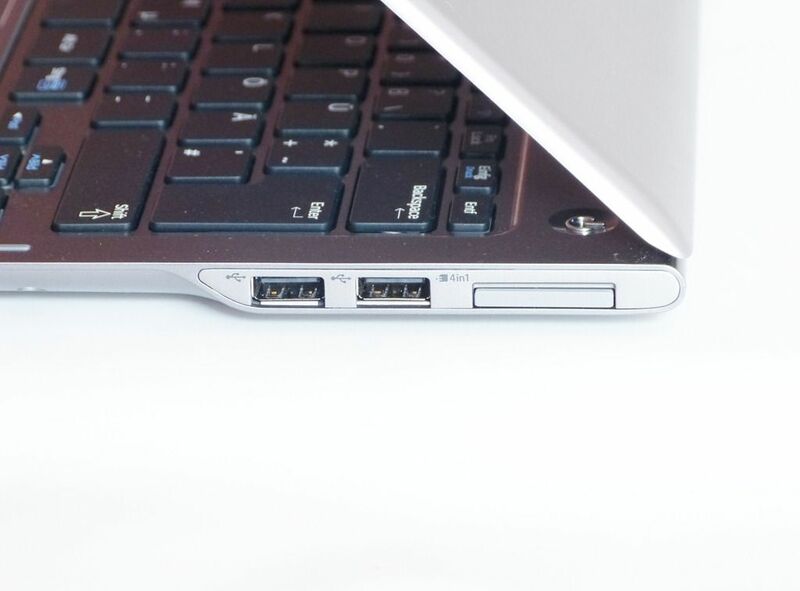 There are enough ports here to satisfy most users. The first 5 minutes are a good quality experience with no shocks, but not major highlights either. 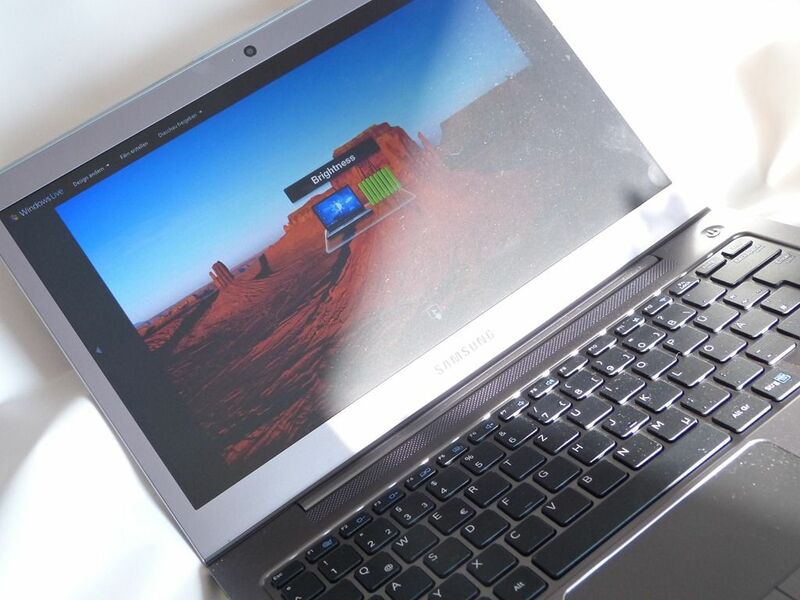 We put the Samsung Series 5 NP530 through a 2hr live review session. You can find the recorded sessions, including a RAM upgrade, in the videos here. During the 2hr live session testing apps and features we recorded the equivalent of 5hr battery life. The model reviewed here is based on a Core i5-2467M 1.6Ghz CPU (Turbo Boost to 2.3Ghz) with 4GB RAM and 500GB Hybrid SSD Full specifications along with links to news and galleries is available here. At 1.47KG (measured) the Samsung is a little on the heavy side compared to other 13.3” Ultrabooks. It has a smaller footprint than the Z830 though. The combination of smaller perceived size and heavier weight give it a significant density disadvantage over other Ultrabooks. In practice though, this is a small and light 13.3” laptop! Like the Toshiba Z830 and the HP Folio 13.3” Ultrabooks, the NP530 comes with a good set of ports. The only thing missing is the full-size VGA port although a mini VGA port is available and works with the included adaptor. The audio in-out port is a combo headset port so get an adaptor ready if you have two connectors on your headset. One USB3.0 port is included, with sleep-n-charge. Samsung have used a mini connector for the power plug, not the standard plug used on other Samsung devices. An access port on the base of the device allows access to an empty memory slot for very easy upgrade to 6 or 8GB RAM. Tested! 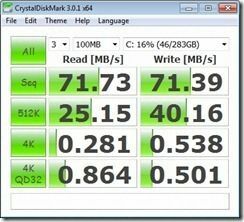 The 7mm SATA HDD is also accessible for those looking for the SSD upgrade path. You can watch a live memory and HDD access/upgrade in this video. The 13.3” 1366×768 screen is a keeper. Good brightness, contrast and daylight readability with a matt finish is about as good as it gets for mobile users although 1600×900 resolution would have been a step up from the Toshiba Z830 that it’s competing with in the market. Having said that, it does have one advantage over the Z830 in that it’s a very strong build. There’s no flex although there is a little bounce in the hinge. Viewing angles are not wide so this is a single-person, head-on screen. The Samsung keyboard is great! Having used the same design on the NP350 for 3 months I was running at 100% speed with no learning curve. There were no missed keys and responsiveness on the keys is great. White on black helps in low light but note there is no backlighting for the keyboard, one thing that the Toshiba Z830 has in its favor and something that, once you’ve used it, you really notice when it’s not available. The touchpad on the test device is made by Elantech and has a big set of settings for single and multiple finger usage, palm rejection and sensitivity. It’s slightly inset which helps locate edges for scrolling and lets you know when your palm is wandering onto the surface. Buttons are nice, separate which a quality medium-weight click. Overall the keyboard/trackpad on the Series 5 is very good. The keyboard especially so. 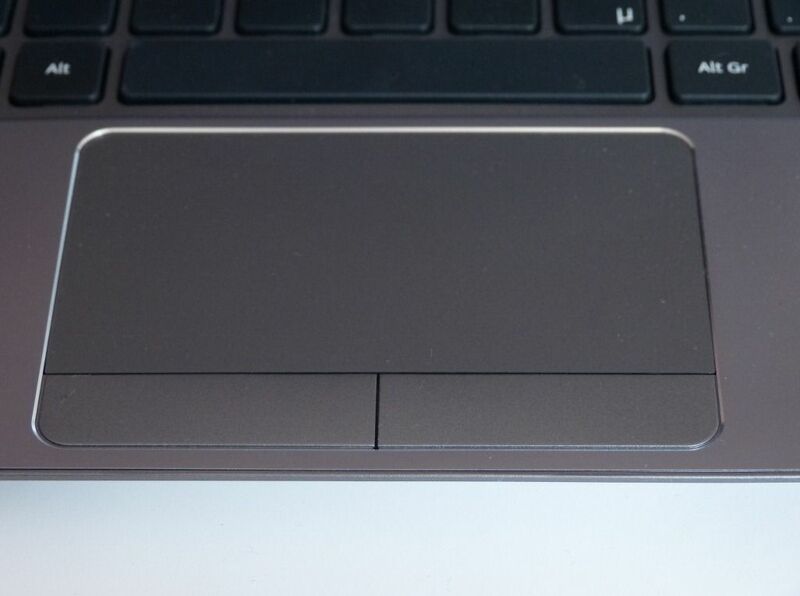 The touchpad can be turned off quickly via a function key. As Ultrabooks employ more and more features it gets harder and harder to test and provide simple performance figures. In the case of the Samsung Series 5 we’ve got a Core i5 CPU that can Turbo to 2.3Ghz under certain conditions and a hard drive with SSD and ‘ExpressCache software, a ‘quick start’ feature a Speed Boot feature and Intel Rapid Start technology. In general, performance is swift to the point of it being transparent when using as a desktop PC with a dual-monitor. Boot, app startup and application performance, WiFi performance and file copy performance won’t be an issue for anybody in the mainstream. As we look deeper into some of the performance figures we can reveal some issues and tricks though. Boot from cold is done in about 25 seconds thanks to the speed-up offered by the Express Cache software and other boot optimisers running on the system. Hibernation is disabled (or hidden from the user as a direct shutdown option) and Samsung / Express Cache take control of this. 4GB of the SSD is reserved for hibernation files so this operation should be fast. Return from standby takes 2-4 seconds depending on programs loaded and length of time in standby. Standby drain has not been tested. 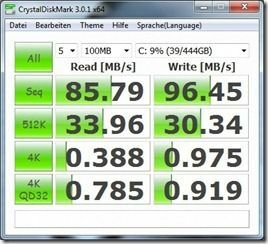 It’s difficult to correlate pure hard-disk read/write figures with real-world usage due to Expresscache which puts some program files into SSD for fast access. Disk speeds using mains power in high-power settings on the left.For comparison, the Acer S3 is shown on the right. The HDD on the Samsung is slightly faster than the on in the Acer S5 so file copies and installations should be quicker, in theory. To test Express Cache, we installed Cyberlink PowerDirector 10 which we know can take 20 seconds to start on an HDD (as tested on the Acer S3, Samsung NP350) but takes 5-8 seconds on an SSD. based device, even in first-boot scenarios. PowerDirector also shows up slow drives in-use too as clips are loaded and cached. In tests (about 15 application re-starts including some reboots over 30 minutes) it was impossible to measure any difference in application startup and usage. With or without Express Cache, first-boot application startup time were consistently around 20 seconds and subsequent startups (from memory cache / disk cache we assume) around 5 seconds. Maybe it takes a lot longer for Express Cache to build up a good cache but without any Express Cache reporting tools it’s difficult to tell. Monitoring the SSD activity didn’t show any activity when the application was started. Update: 24hrs later, after a fresh reboot, Cyberlink PowerDirector started in 14 seconds instead of 20 seconds. On checking Express Cache usage we see that 8.67GB of the 10GB application space is now in-use. We suggest giving Express Cache a few days of normal use to start learning application patterns. Given that the Acer S3 hybrid solution is only used for standby/hibernation it’s clear the the Samsung solution is going to better for the end user. 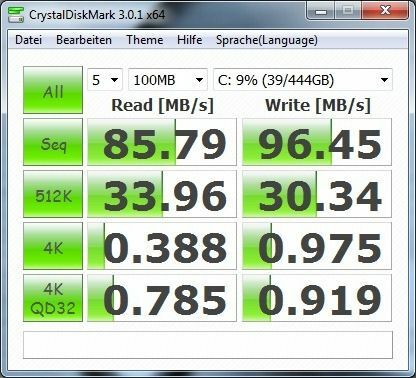 We can also say that a full SSD still has major advantages over hybrid / ssd / cache solutions and that customers need to be aware of that ‘hybrid’ disks are not all the same. Audio from the built in speakers is relatively loud for an Ultrabook and of reasonable quality. There are some advanced audio features to be found in the settings but nothing that isn’t effectively an EQ setting. Sound quality is not as good as the excellent solution on the Asus UX31 but good enough for YouTube and a bit of quiet background music and radio. Over headphones the sound was clean. If you want the best audio out of the Series 5 you’ll take the digital audio via the HDMI port which we tested. It worked at 1080p and transmitted digital audio to a TV with no problems. Like all notebooks based on 2nd-gen Core processors, the Samsung Series 5 supports full HD (1080p) decoding in hardware and we tested it up to 30Mbps which is as high as you’ll get on most consumer video cameras. DVD and Blu-ray should be no problem (Blu-Ray not tested) and you’ll find that the CPU barely moves during the process as all the work is done in dedicated silicon. For the 30Mbps H.264 file (2-channel audio) we saw 8-15% max CPU load in power-saving mode and a power drain of around 11W for about 4 hours of HD playback. In addition to HDMI out there’s a second method that can be used with compatible equipment. The Wi-Fi card, a Centrino module, supports Intel Wireless Display (Wi-Di) so you can send 1080p video to a screen without a cable. Wireless CD-quality audio is also supported over Wi-Di. A Wi-Di / HDMI receiver costs from around $80. 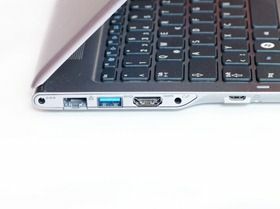 The Sandy-Bridge 2nd generation core platform used in all first-gen Ultrabooks includes the Intel Quick Sync Video hardware that, through use of an Intel SDK, can provide accelerated encoding capabilities for common video file formats. It’s useful for a number of scenarios but the one that most people will probably use is format conversion so that large-format videos can be reduced to more portable versions. Using Cyberlink MediaEspresso, a program that came free with our Series 5 (via a limited edition software license pack) and supports the Intel Quick Sync Video subsystem, we were able to convert a 50 second video from 1080p to a YouTube upload-friendly 2mbps 480p (M2TS file) in about 19 seconds under the Samsung Optimised power mode (battery-powered.) It isn’t the fastest we’ve seen on an Ultrabook. For field reporters needing to record in full quality the quick-sync video hardware provides a great way to crunch the video for upload either in quick time (newsrooms will be particularly interested in this) or over low-bandwidth connections but the Samsung Series 5 doesn’t appear to capitalize on the feature as well as other Ultrabooks. The Intel Quick-Sync video feature found on all Ultrabooks can also be used by video editing programs to speed up, significantly, the rendering process. We use Cyberlink PowerDirector 10 to test video editing on Ultrabooknews as we’re pleased with its stability and support of the Intel Quick Sync Video. A quick test of Cyberlink PowerDirector 10 to sequence two H.264 1080p 50 second videos together with a fade and down-convert to a more portable 6Mbps (H.264) 720p format, on battery power, was completed in a disappointing 3 minutes and 30 seconds (Acer S3 = 2mins, Z830 1.7Ghz = 1 min 33s) which by far the slowest we’ve seen on this test. As before, we didn’t see much action from Turbo 2.0. A brief rise to 1.8Ghz and then down to 1.6Ghz for the rest of the test. The web cam, a 1.3MP unit is responsive and good quality in a daylight lit room. The Samsung Series 5, like all Ultrabooks, isn’t a ‘gaming rig’ but it’s capable of some gaming entertainment if games are chosen and configured carefully. What we did find on the Series 5 is that Turbo 2.0 wasn’t as long-lived as on some other Ultrabooks. It appears that Samsung have engineered the thermal / Turbo 2.0 settings to be on the quiet/lower performance side so among 1st-generation Ultrabooks, the Series 5 is not be the fastest. We skipped our usual Half-Life 2 and AppUp Pinball tests and went straight to Just Cause 2, a Steam-based download. It’s a 2010 game and, importantly, it has a benchmarking mode. The demo runs at an unusably low frame rate under default settings, just as with other HD 3000 – powered graphics units. In this test, 6.63FPS with default settings and resolution, mains power and high-performance mode. For comparison the Asus UX31 (Core i7) manages 9 fps but it has a much larger 1600×900 display. The Z830 with 1.6Ghz Core i5 manages 10.5 FPS. The Z830 with 1.7Ghz Core i5 managed 14.3 FPS. 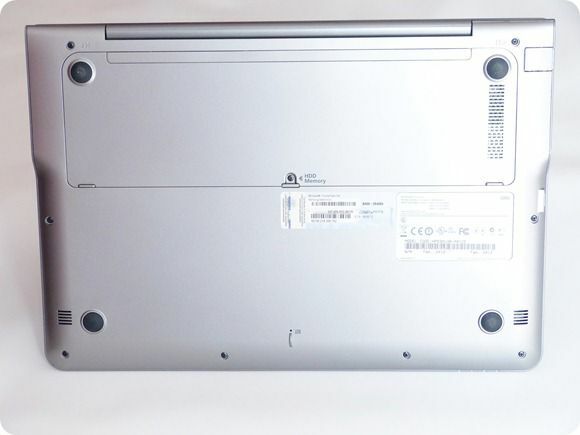 Note that 2nd generation Ultrabooks will introduce greatly improved gaming graphics capability but won’t be available until at least June 2012. The fan on the Series 5 did ramp up during the gaming and video tests but wasn’t loud. Only an air rush was heard. Heat build-up on the base was significant. You’ll find a Facebook ‘Like’, Twitter and Google +1 buttons above. Please take the time to promote us if you feel this review was useful. It will help us with the next Ultrabook review. Thanks! One of the features of the Samsung Series 5 is the port selection and that includes a full-size Gigabit Ethernet port. In addition you’ve got an Intel Centrino 6230 Wifi and Bluetooth module. The Wifi includes My-Wifi (Wifi direct) support along with Wireless Display support. While we haven’t been able to test the Wireless Display we have been impressed with the quality of the wireless connection. 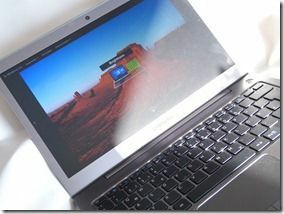 Range is good as is throughput but it’s not the best we’ve seen among Ultrabooks. The Centrino 6230 supports two antennas (we can’t confirm if they are both used on the Series 5) and supports 2.4 and 5Ghz bands for throughput up to 300Mbps. The Bluetooth module supports up to 3.0+HS too which means you can potentially get fast transfers over Bluetooth. Didn’t see anything about battery life. Main important thing in ultrabook. So, I guess the battery life is bad, not going to buy this one. Could you please run a http://www.cpubenchmark.net/? It should take 5 min. I could compare then a lot. CPU and overall perfoarmance. although i am waiting for the samsung series 9 in april. A CPU benchmark is not going to help you here for the reasons I mention in the article. There’s cache SSD and Turbo boost to take into consideration. GPU too. I could take the Series 5 out of the fridge and run a 2.3Ghz Turbo-boosted result for you or leave it on battery and give you an 800Mhz ‘Samsung Opmtimised use’ value. Sorry Ali, I advise reading a few more reviews (they will be listed in the product information page) to get a better feel for the performance. Anyone know if the Samsung NP300 is getting refreshed? I prefer the small dimensions and weight of the NP300. Also, have you tested the HS part of Bluetooth 3.0 + HS? I have a Thinkpad T420s that supposedly supports Bluetooth 3.0 + HS but my Bluetooth 4.0 (I heard HS is required in 4.0) Motorola Droid 4 doesn’t get anything faster than 1.0 – 1.5 Mbits/s when transferring files. Pretty far from the theoretical 24 Mbits/s. BT HS is something that not many people are going to experience in the real world. At least for the next year. I’ve been looking at it for 2 years and even with the amount of products I test, I’ve never had it working. I’ve been hoping for an Ivy Bridge update for the NP300 as well. It has the smallest footprint of all the 11.6″ notebooks I’ve found so far. I don’t care if it’s labeled as an ultrabook or not. As for BT 3.0 + HS, I’d like to see battery usage (notebook and phone) for internet tethering as compared to using your phone as WiFi hotspot. I’ve been searching around and haven’t found anything. With pretty much all notebooks and phones coming with either BT 3.0 + HS or 4.0 now, I was hoping for some information on the internet but came out empty handed. I’ve been hoping to make use of the Bluetooth 4.0 of my 4G phone with the new 24 Mbps link mainly because I also am interested in the possible battery savings when compared to making my phone a WiFi hotspot. USB tethering would probably have the best battery savings but I’m searching for an 11.6″ ultrabook for a reason. My intended work areas pretty much only have space for a small footprint 11.6″ notebook. I’d really like to see real world power consumption tests when compared to using hotspot tethering. The 24 Mbps 802.11 link is supposedly only on when transferring a lot of data and completely off when not. I assume the idle power of the slower Bluetooth link is much less than a powered idle WiFi connection. For my mobile computing needs footprint and battery life are my top priority. Sacrificing thickness and weight for that is okay. I’m interested in Bluetooth tethering as well. When my ultraportable is connected to the internet it’s almost always through my Verizon 4G phone since I travel often to places with no WiFi. When there is WiFi it’s almost always too slow. Right now, I mostly use the hotspot feature of my phone and when space permits, I tether via USB. Since I want to squeeze as much battery life out of both my devices as I can, I’m really interested if Bluetooth 3.0/4.0 tethering (PAN or DUN) will actually help. I’d also like to know how much of that 24 Mbps is actually usable. I’ve only gotten 1.0 – 1.5 Mbps with Bluetooth 2.1 + EDR. If so, then I’ll make Bluetooth 3.0/4.0 a requirement for my next ultraportable purchase. I have a Motorola Droid 4 too. I really want to see what the real world speeds are of the new HS spec of Bluetooth 3.0/4.0. Of course it also has to consume less battery life when compared to tethering via the WiFi hotspot. FYI, I added the Series 13 video playlist at the end of page 2. 1366×768, Really? When do these guys finally start to make displays with useable resolutions. The Asus UX## has FullHD on that scale so where is the problem? Got too play with a 14″ Series 7 np700z3a today & it was fantastic, for just a few more dollars ($999US) it has a 16×9 screen & dedicated GPU. It’s going to be SO exciting to see in the next few years how the PC gaming industry is shaped around Ivy Bridge/Kepler & Ultrabook’s. Finally the PC gaming industry is starting to understand that if they want to compete against iOS, Android, consoles, in the future then they need to forget about desktops & start focusing on integrated solutions. I think the fact Samsung is pushing these slim bezel displays which make it the same size as other manufactures smaller-screen machines should really be made more mention of. 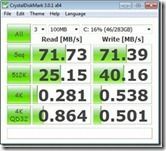 Article request: I’d really, REALLY like to see an article that focuses on the differences between the various Ultrabook’s Express Cache implementations and on the impact of updating the hard disk drive in these devices to an SSD. -Won’t “express cache” keep running under the assumption that it’s SSD is faster than a replacement SSD (which is highly unlikely based upon the perf numbers that these things are posting). -It would be terrible to see your most used files moved from your new expensive “real SSD” to the slower express cache SSD. -Also is it possible to upgrade the express cache SSD component to a larger capacity later and just leave the HDD? I’m a happy owner of this really nice laptop. As I would like to make the battery life even better and get better performances, I would like to replace the HDD by an SSD. I copied both Windows 7 partitions but the computer doesn’t want to boot on the SSD. I disabled ExpressCache but that didn’t change anything. Did someone succeed such a replacement? Actually, I can’t even boot from the USB key. First, thanks on this useful review and terrific site. I have a question regarding the series 5 (and, I suppose, ultrabooks in large): it seems the battery is unreachable. 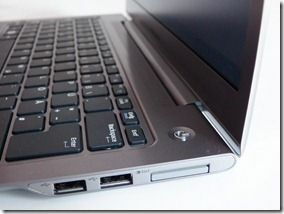 Would that render ultrabook useless once the battery has died? The battery is likely to be replaceable by a service center. The cost will he relatively high of course. We have no data on how long the battery will last and how much it would cost though. the Samsung Series 5 is on offer today in the USA. Have you had the chance to test the built-in microphone? Mine is recording extremely muffled sounds and it really prevents me from using Skype and other things: people on the other end simply cannot hear my voice. I tried everything i could think of: settings, re-installing the driver, etc. but nothing worked. Do you have the same problem on yours? Hi, I just bought this laptop and seem to have the same problem as Alex above. Has anyone got more information on this? Hi, I’m about to buy one but the problem with the built-in microphone is scarying me. Chippy, did you see the same issue on the one you bought for your wife? If that might help, I can actually say that the problem I noticed with the microphone disappeared… Not sure what it might have been (maybe an issue with Skype itself at that time?) but now it is all fine. And I am very happy with my laptop ! Really light, fast, and performant. I too have a problem with the microphone. Skype calls do not go well as I come across muffled and breaking up. 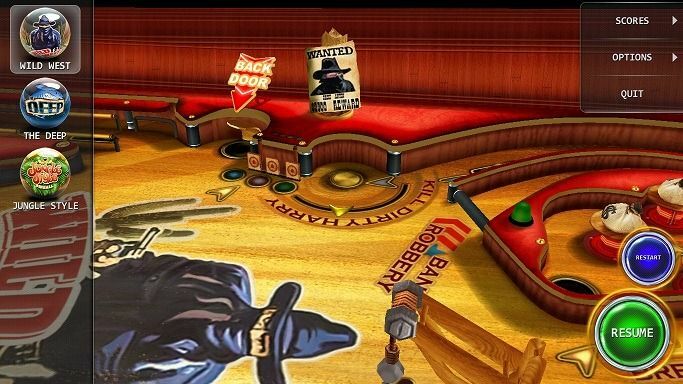 Has anyone found a solution? hi, seems pretty good for me for the fact that i will be using it only on weekends when i travel if ever. I have a question though, how long should you charge this thing? Just bought the machine for my wife and found out the built-in microphone is having the same issue as described above by alex. If anyone has a clue what’s going on, would you please share below? Thanks! Can the touch screen be disabled? hello there and thank you for your info ? I have definitely picked up something new from proper here. I did then again experience some technical issues using this site, as I skilled to reload the site a lot of occasions previous to I could get it to load correctly. I were considering in case your web host is OK? Now not that I am complaining, however slow loading circumstances instances will sometimes affect your placement in google and could harm your high-quality ranking if ads and marketing with Adwords. Well I’m including this RSS to my e-mail and can glance out for much extra of your respective interesting content. Make sure you update this again soon..
« Samsung Series 5 Ultrabook De-Tuned for Politeness?